BEAUTIFULLY CHAOTIC DESIGNS - Dread falls, extensions and more! 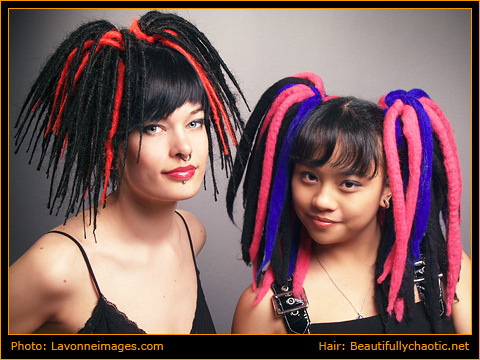 Since 2000, we here at Beautifully Chaotic Designs pride ourselves in creating beautiful hairpieces, wigs and extensions for those seeking alternative and extreme hairstyles - from goth club-goers to cosplayers, we do our best to customize our products to the needs of our customers. We have a full catalogue of our designs and we love to do custom designs - examples are included on the website. If you have any questions, feel free to contact us at admin@beautifullychaotic.net. Beautifully Chaotic Designs is no longer accepting extension dreads or hairpiece orders. There are many other highly skilled haircrafters out there - for a few, check out my links section! We are still accepting creative and collaborative custom projects and special orders (including cosplay/costume wigs) on a case-by-case basis so please email and inquire.